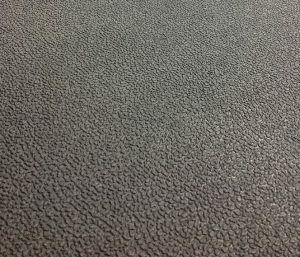 Unlike carpeting, rubber floor matting won’t stain. Rubber is also easier-to-clean and offers greater wear resistance than fabric. In a mobile equipment cab, an operator’s feet may remain in the same position for extended periods of time. With carpet floor mats, heel wear can cause holes in the fabric. This exposes the subfloor, introduces a potential safety hazard, and provides a path for engine sounds. 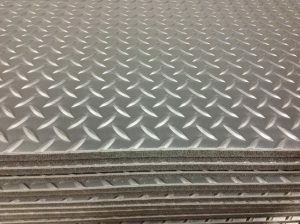 Rubber flooring can also be used as a kick-plate to protect cab walls from contact with an operator’s boots. To protect the cabin and the operator, mobile equipment manufacturers choose rubber floor mats from Elasto Proxy. By reviewing your CAD files, we can help prepare your mobile equipment insulation for manufacturing. We can also help you with material selection so that your cabin flooring matches the larger color scheme of your mobile equipment, including the cab insulation. Typically, rubber flooring is black; however, Elasto Proxy can also custom-fabricate rubber floor mats in colors such as gray or brown. 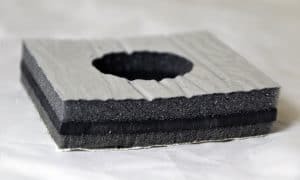 As part of the material selection process, our solutions providers may recommend rubber with a pebbled texture or with recessed, diamond-shaped features that can catch water. 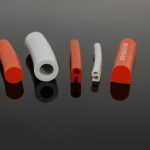 These durable surface materials are laminated to an acoustical foam that’s typically 3/8” or 5/8” thick. With larger diesel-powered equipment, thicker foams are used. 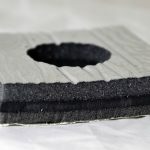 Elasto Proxy has the technical expertise to recommend the right acoustical foam and thickness for your specific noise levels and decibel reduction requirements. 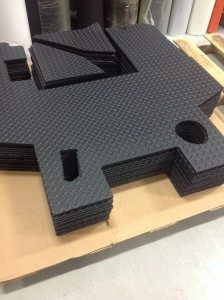 After Elasto Proxy laminates the rubber surface material to the acoustical foam, we use water jet cutting to produce floor mats that meet your precise dimensional specifications. By sending your CAD files directly to our digital equipment, we can meet tight tolerances. With the rubber flooring that’s near the driver’s seat, we can cut precise openings for the arms that attach to the gas and brake pedals. With the kick plates that meet the cab insulation, we create clean, straight lines. Water jet cutting is ideal for cutting bolt holes for cab seats, but this custom fabrication technique can also tighten controls over project costs. Because there are no tools or waiting for tooling, you can get quick-turn prototypes and change your floor mat designs cost-effectively. Water jet cutting is also a smart choice for low-to-medium volume manufacturing because you only order the materials that you need. So whether you’re introducing new mobile equipment or replacing rubber flooring, contact Elasto Proxy. Rubber floor mats from Elasto Proxy don’t just resist mud, snow, dirt, and water. They also absorb engine sounds and support your engine bay insulation. If you’re looking for rubber floor mats for mobile equipment, we’d like to hear from you. For over 25 years, Elasto Proxy has supplied custom sealing and insulation solutions to companies like yours. Do you need samples that you can show to purchasing, engineering, or operations? 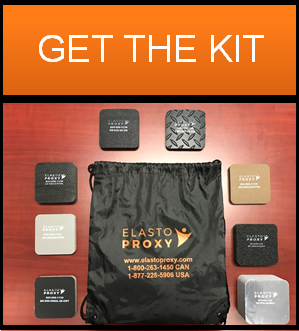 Then request Elasto Proxy’s sample insulation kit. Packaged in a black-and-orange cinch bag, this sample bag contains representative samples of mobile equipment insulation from Elasto Proxy.